This morning we had just 8mi to hike to Abol Bridge, which is a name we’ve been hearing for awhile. It is pretty much the end of the 100 Mile Wilderness and the beginning of Baxter State Park which is home to Mt Katahdin. There is also a camp store there to resupply for the final day. Jett Cat got going at 6am and I left at 6:30am. It was nice hiking all morning and it rained slightly the second half of the morning. I caught up to Jett Cat just a mile before we hit the bridge around 8:30am. Once we but the road, we were walking next to each other and Jett Cat was whistling something cheerfully (which she tends to do) and suddenly she stopped and looked at me in shock and said, “We only have 15mi left!” It finally hit her at that moment that the hike was ending. I was waiting for it to hit her and it hit her like lightning all of a sudden in that moment. This is the look I got just as she realized it. 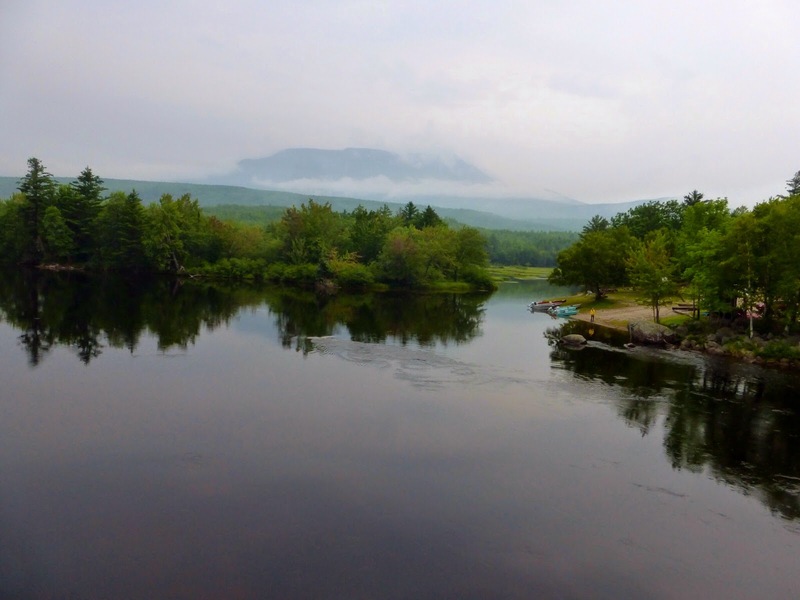 There was a view of Katahdin as we crossed the bridge. It was a bit foggy, but it’s there. We planned to meet Squatch at the camp store so he could give us his GoPro camera to take some footage of our finish for the documentary. Squatch recently had hernia surgery and still has a couple weeks of recovery before he gets back on trail. While we waited, we rewarded ourselves with chocolate milk! 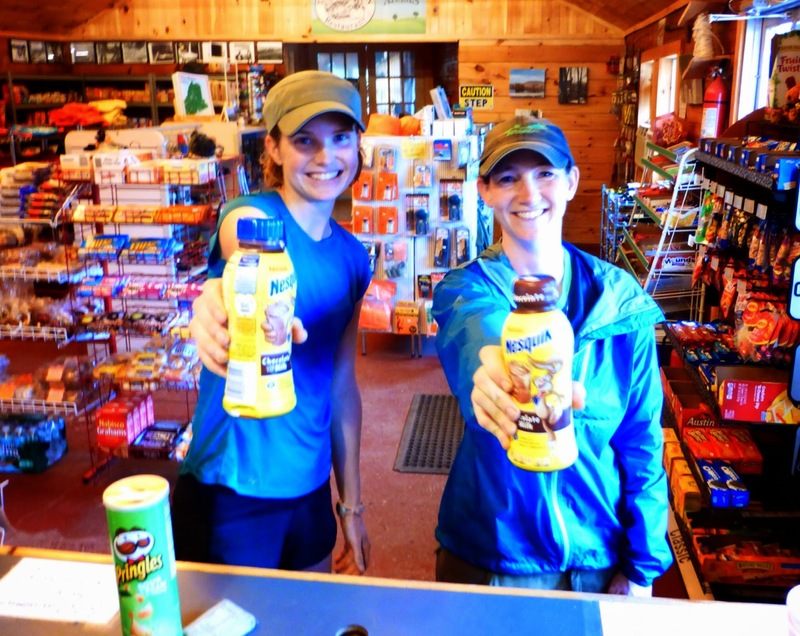 When Squatch arrived, we realized that we only had ten more miles to go to our final campsite, so had time to go into town and eat at the Appalachian Trail Cafe in Millinocket about 40 minutes away. We were quite happy to be in the car as the rain fell harder. 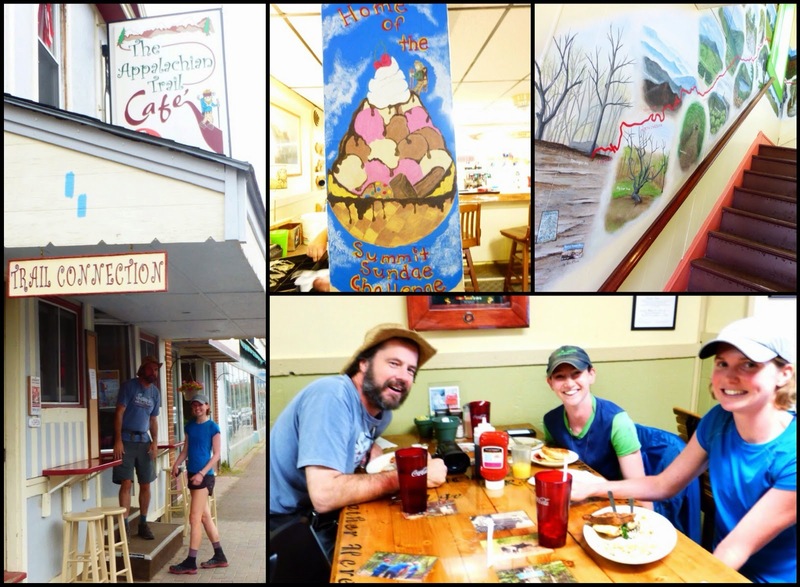 The Appalachian Trail Cafe is great and we may be returning tomorrow for our post trail celebratory meal. They have an ice cream sundae challenge that includes 14 scoops of ice cream(one for each state) and tons of toppings/sides. They have lots of AT memorabilia on the walls and it was great to be there the day before we finish. There is also an upstairs lounge area with a computer I was able to use to get the last two blog posts up. There was a great mural leading up the stairs to the lounge area that had a significant memory from each state as you go up the stairs. It was just perfect to go up the stairs like we do on the trail and reminisce about each state and the hike. Just a great moment. 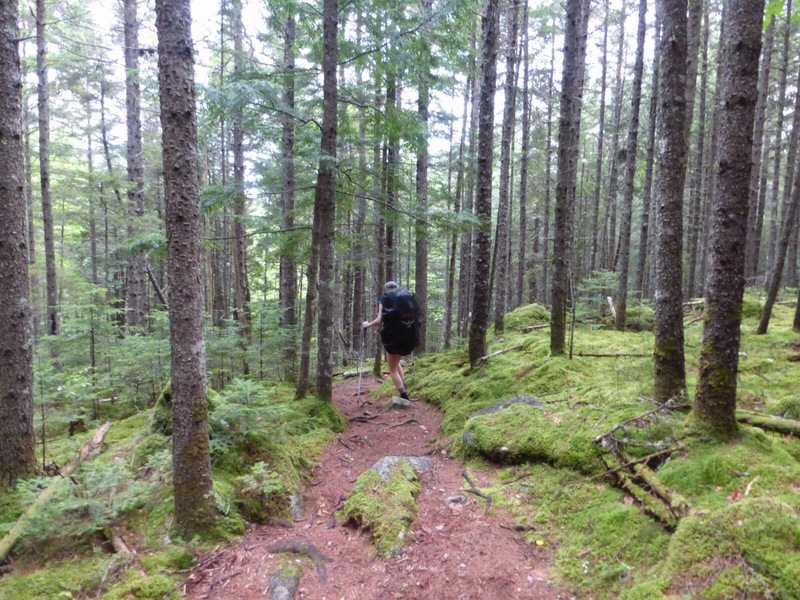 Squatch got us back to the trail by 2pm to do our final 10mi into Baxter and to the final campsite for thru hikers, The Birches, at the base of Katahdin. 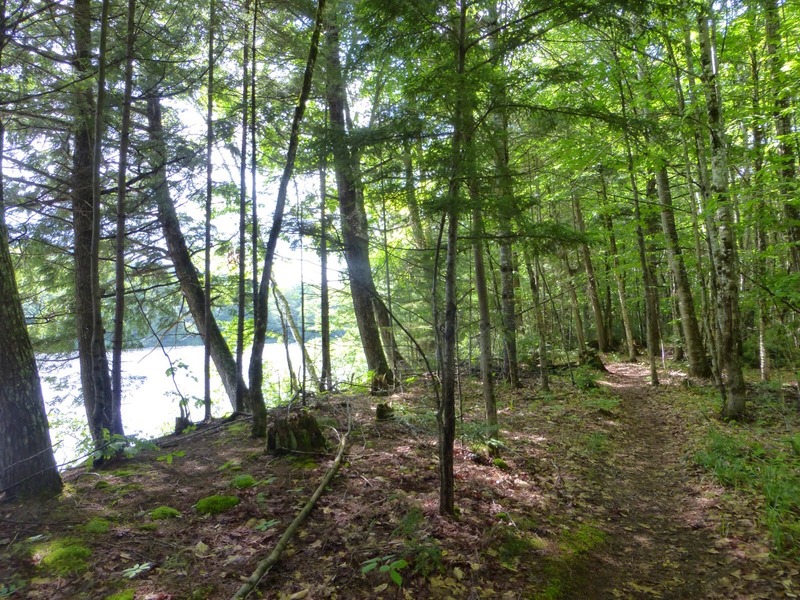 It was a great trail through the park and much of it walked along a stream. We did have to use the DEET again, but the bugs didn’t bother us after we put it on. 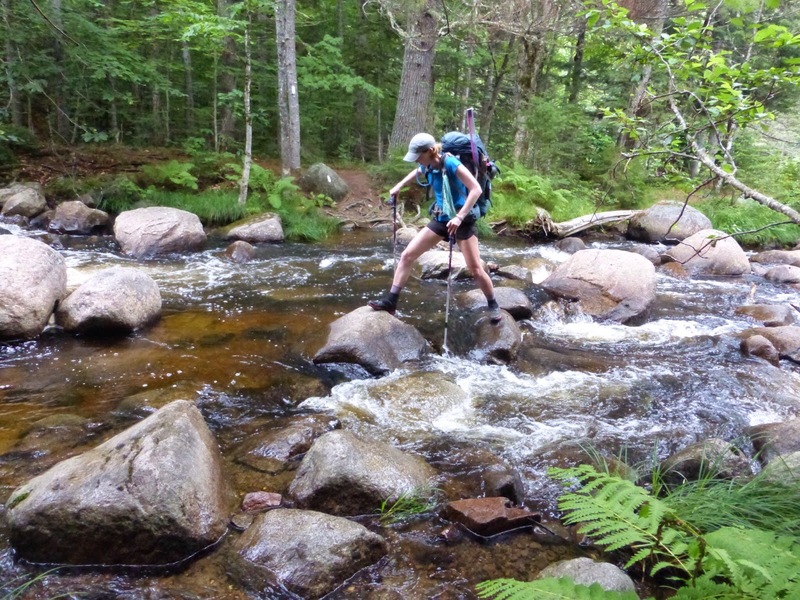 There were a couple stream crossings to make things fun and we were happy to finish this long leg with pretty much dry feet. We hiked in with Subway sandwiches and stopped at the base of Big Niagra Falls to sit in the shade and take in one of our final breaks together on the AT. It was pretty perfect and we couldn’t have asked for a better end to this journey. I mean Subway at a waterfall, it just doesn’t get much better! Just to make things interesting, the sky darkened and thunder rolled just as we were arriving to The Birches. 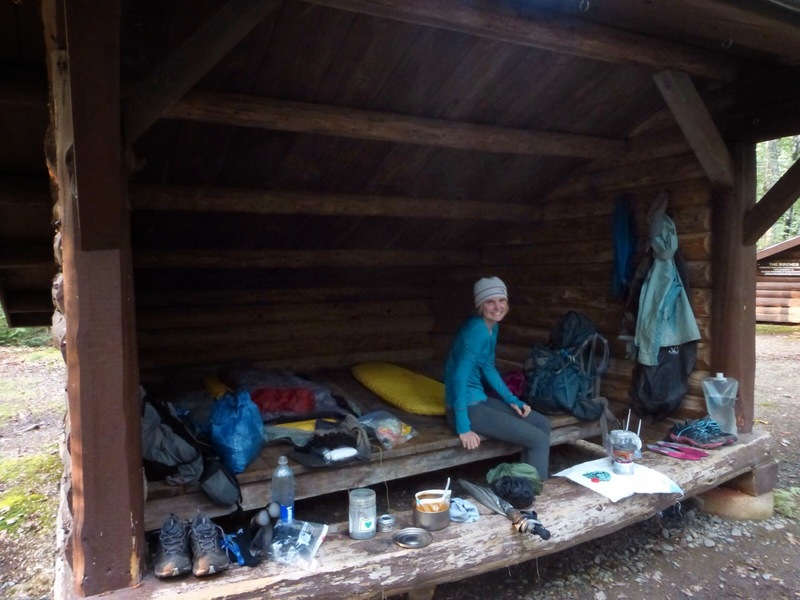 The campsite has room for 12 and is reserved for thru hikers. We checked in at the ranger station and found out that we should be number 134 and 135 to finish this year. We got to the campsite just as the rain started to fall again and we just couldn’t believe our incredible timing. We found out that we had the whole site to ourselves! Turns our that Seabiscuit pushed hard the last two days to finish today as he was done and ready to return home. Here is The Birches campsite. There are two small lean-tos here and they are really clean with no bugs so we decided to sleep in one of the lean-tos. I have never slept out of my tent so this is big for me! Jett Cat has only done it a few times, but we didn’t want to deal with wet tents and it just seems like a great way to spend our final night in our own little place. So the bad news is that the next two days have 50% chance or higher of thunderstorms. We just need to go for it cause we can’t wait it out for two days. Our understanding is that the chance for rain tomorrow isn’t until after 10am, so we decided to get up at 2am and hike up as the sun is rising to hopefully dodge the rain. 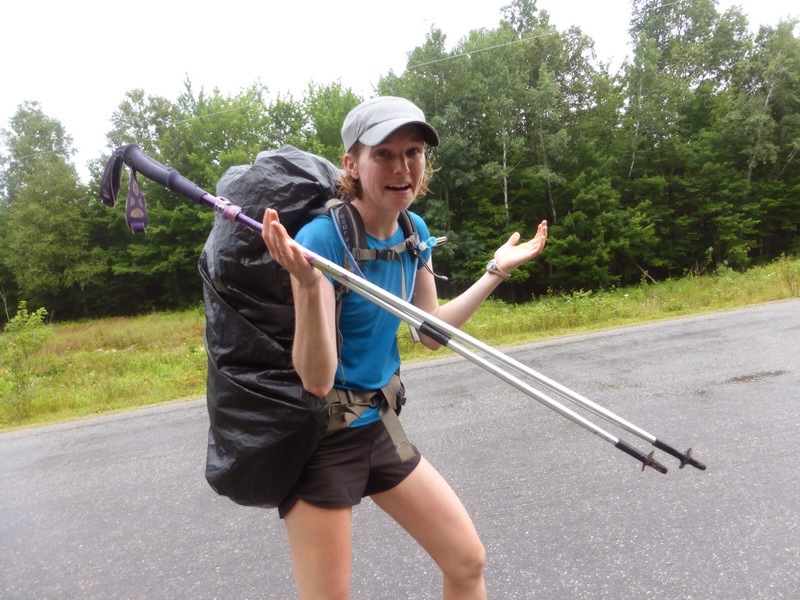 Most hikers use loaner day packs to summit and return to the campground for their belongings when they finish. 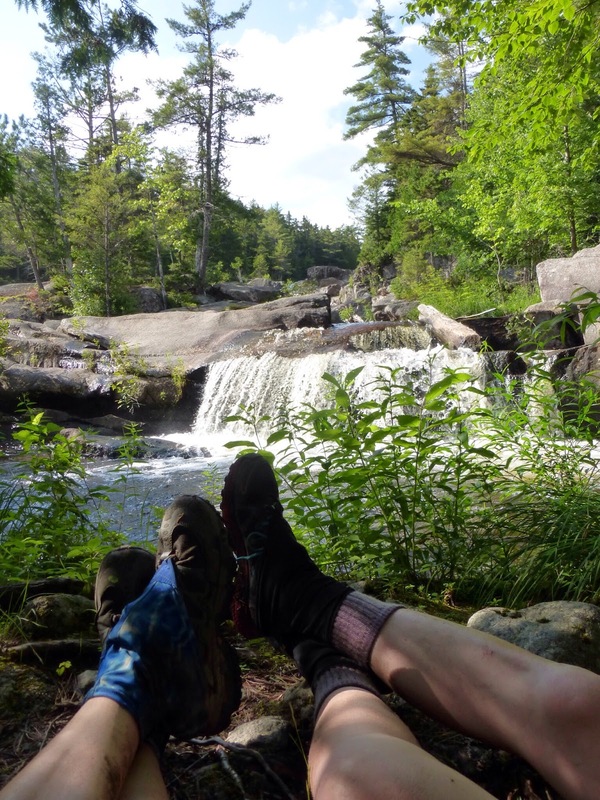 The option we would like is to go up and over Katahdin by going down a trail called Knife’s Edge which is supposed to be really cool, but have a bit more challenge with climbing down in one section. It seems like an epic and perfect way for us to finish if the weather holds. We will decide while we are up there. So this is it! The final night! We are both quite happy and excited. I’m so thankful to have Jett Cat here who also enjoys this kind of stuff and is just as excited as I am to wake up in the dark and head up an intimidating mountain. We hope our strategy pays off, but either way, we know it will be a memorable summit. It is very bittersweet as I’m sure readers can understand. We are excited to be completing such a big adventure, but we also aren’t ready for this to end. We have our moments of sadness and then great happiness as we want to be happy while we are still out here rather than thinking of what is to come after the next 24hrs. We are fortunate to have crossed paths for this experience and are going to soak it up the best we can while we are still together. Tomorrow is the big day and we’re pumped! On a side note, it is just before 10pm and another hiker just walked up. We were expecting him and don’t know him, but he is in the other lean-to.